Chrom4’s Sample Handling line is one of the most extensive lines available in the chromatography industry. They have top notch quality suppliers for vials, caps and inserts as well as Porvair’s and Ritter’s excellent lines of 96-well plates and mats. Chrom4’s vials are produced under the most stringent conditions with highly sophisticated production technology out of first class hydrolytic glass. Only Schott glass is used as raw material, which results in an outstanding product. 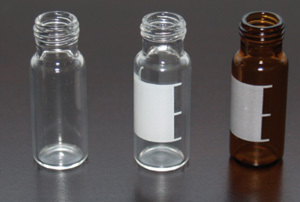 Chrom4’s headspace vials and caps form a tight seal which is very important to get reproducible results. In headspace analysis, the sample is sealed into the vial and heated until the concentration in the gas phase is in equilibrium with the concentration in the liquid phase. The same high standard is found with Chrom4’s LC/GC columns.